Flag of the Saint George Ribbon. The Ribbon of Saint George (tied). The pattern is thought to symbolise fire and gunpowder. It is also thought to be derived from the colours of the original Russian imperial coat of arms (black eagle on a golden background). The ribbon of Saint George (also known as Saint George's ribbon, the Georgian ribbon; Russian: георгиевская ленточка, georgiyevskaya lentochka, and the Guards ribbon in Soviet context: see Terminology for further information) is a Russian military symbol consisting of a black and orange bicolour pattern, with three black and two orange stripes. It appears as a component of many high military decorations awarded by the Russian Empire, the Soviet Union and the current Russian Federation. In the early 21st century, the ribbon of Saint George has come to be used as an awareness ribbon for commemorating the veterans of the Eastern Front of the Second World War (known in post-Soviet countries as the Great Patriotic War). It enjoys wide popularity in Russia as a patriotic symbol, as well as a way to show public support to the Russian government, particularly since 2014. However, it is much more controversial in other post-Soviet countries, such as Ukraine and the Baltic states (Estonia, Latvia and Lithuania), due to its association with Russian nationalism and irredentism. As the ribbon of Saint George has been used by different Russian governments, multiple terms exist for it in the Russian language. The ribbon first received a formal name in the Russian Empire, in documents prescribing its usage as an award: the Georgian ribbon (Russian: георгиевская лента, georgiyevskaya lenta). The old Tsarist term was used in the Soviet Union to describe the black-orange ribbon in the Soviet award system, but only in non-official contexts, such as the Military History Journal published by the Soviet Ministry of Defense. Formally, the black-orange ribbon on the badges, flags and cap tallies of Guards units was called the Guards ribbon (Russian: гвардейская лента, gvardeyskaya lenta), while the same ribbon as it was used in other Soviet awards had no official name. In the military terminology of the Russian Federation, both Tsarist and Soviet terms are used. The modern term георгиевская ленточка (georgiyevskaya lentochka, distinguished from the Tsarist term by the usage of the diminutive) comes from the Russian 2005 program of the same name, and is used to refer to the mass-produced awareness ribbons as opposed to the original military awards. The usage of the epithet Georgian in reference to that ribbon is subject to controversy in Russia, due to its Tsarist connotations, and thus sometimes the term Guards ribbon is used to refer to the modern ribbons as well, as they are meant to commemorate the Soviet period of Russian history. Due to its usage by the pro-Russian insurgents fighting in the Donbass War (and supporters of Russian irredentism in general), the ribbon has gained a number of derogatory nicknames in Ukraine, particularily among the supporters of the Euromaidan, such as the "Colorado ribbon" (Russian: колорадская лента, koloradskaya lenta; Ukrainian: колорадська стрічка, kolorads'ka strichka), after the black and gold stripes of the Colorado potato beetle. Over time the term "Kolorad" has become an ethnic slur for Russians in Ukraine. Gold Sword for Bravery, one of the first instances of the Georgian ribbon used independently. The Georgian ribbon emerged as part of the Order of Saint George, established in 1769 as the highest military decoration of Imperial Russia (and re-established in 1998 by Presidential decree signed by then President of Russia Boris Yeltsin). While the Order of Saint George was normally not a collective award, the ribbon was sometimes granted to regiments and units that performed brilliantly during wartime and constituted an integral part of some collective battle honours (such as banners and pennants). 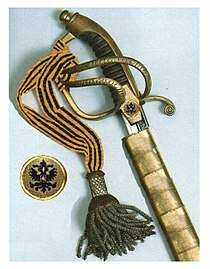 When not awarded the full Order, some distinguished officers were granted ceremonial swords, adorned with the Georgian ribbon. In 1806, distinctive Georgian banners were introduced as a further battle honour awarded to meritorious Guards and Leib Guard regiments. These banners had the Cross of Saint George as their finials and were adorned with 4,44 cm wide Georgian ribbons. It remained the highest collective military award in the Imperial Russian Army until the Revolution in 1917. In the original statute of the Order of Saint George, written in 1769, the currently orange stripes of the ribbon were described as yellow; however, they were frequently rendered as orange in practice, and the orange colour was later formalised in the 1913 statute. The colours are said to symbolise fire and gunpowder of war, the death and resurrection of Saint George, or the colours of the original Russian imperial coat of arms (black eagle on a golden background). Another theory is that they are, in fact, German in origin, derived from the or and sable stripe patterns found on the heraldry of the House of Ascania, from which Catherine II originated, or the County of Ballenstedt, the house's ancient demesne. 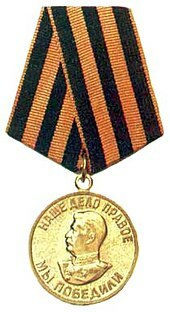 The association of the Georgian ribbon to Soviet victory in the Second World War stems from the "For the Victory over Germany" medal. The original Georgian ribbons disappeared alongside all other Tsarist awards after the October Revolution, although previously earned Crosses of Saint George was allowed to be worn. However, the symbol would reappear during the Second World War, as a symbol of office for the newly established Guards units, whose badges and banners were adorned with black and orange ribbons in a similar manner to old Imperial regiments  Later, the same ribbon would be used for the Order of Glory (Russian: Орден Славы, Orden Slavy), an award given for bravery to soldiers and non-comissioned officers similar to the Tsarist Cross of Saint George, and the medal "For the Victory over Germany" (Russian: За победу над Германией, Za pobedu nad Germaniyey), awarded to almost all veterans who participated in Eastern Front campaigns. As part of the original Tsarist awards, the ribbon was also used by the collaborationist Russian Liberation Army. After the war, the ribbon would be sometimes used in postcards commemorating the veterans of the war; however, the ribbon did not hold the public significance it has today. Yulia Latynina and other journalists have speculated the Russian government introduced the ribbon as a public relations response to the 2004 Orange Revolution in Ukraine in which demonstrators had adopted orange ribbons as their symbol. Later on, the ribbon has been adopted by Russian nationalist and government loyalist groups. During the 2011–13 Russian protests, protestors demonstrating against electoral fraud in the 2011 elections carried white ribbons. Supporters of Putin would counter-protest wearing Saint George's ribbon. On 28 April 2016, a group of people from the National Freedom Movement wearing St. George ribbons attacked a school competition organized by the Memorial society, pouring toxic solution of Brilliant Green to writer Ludmila Ulitskaya and other guests and assaulting a journalist. The Russian ultranationalist group National Liberation Movement (NOD) has adopted the orange-black flag as its symbol. During the events of 2014 in Ukraine, Antimaidan activists and the pro-Russian population of Ukraine (especially in the south-east regions) used the ribbon as a symbol of pro-Russian and separatist sentiment. The pro-Russian paramilitary groups, such as the Donbass People's Militia paramilitary group, also use them in their uniforms and emblems. In April 2014 the veterans of Kirovohrad banned the symbol from Victory Day celebrations "in order to prevent provocations between the activists of different movements". Instead, only Ukrainian state symbols would be used. The next month Cherkasy urged veterans and supporters not to wear the ribbon or any other party symbols. The Ukrainian government replaced the ribbon with a red-and-black remembrance poppy, like those associated with Remembrance Day in Western Europe in 2014. On May 16, 2017 the St. George Ribbon was officially banned in the country, with those who produce or promote the symbol subject to fine or temporary arrest. According to Speaker Andriy Parubiy, the symbol had become a symbol of "Russia's war and occupation of Ukraine." On 5 May 2014, the Belarusian Republican Youth Union encouraged activists not to use the ribbon. Other officials reported that the decision not to use the symbol was related to the situation in Ukraine, "where the ribbon is used by militants and terrorists". In time for Victory Day 2015, the ribbon's colors were replaced by the red, green and white from the Flag of Belarus. But the President of Belarus Alexander Lukashenko arrived on 7 May 2015 in Moscow with a Saint George ribbon combined with the flag of Belarus placed on the lapel of his jacket, thus showing his personal positive attitude to the ribbon. During preparation for the first Victory Day parade in the Canadian city of Winnipeg on 10 May 2014, the Russian embassy distributed Ribbons of Saint George to participants. The move was considered controversial in view of the ongoing events in Ukraine with the Ukrainian Canadian Congress calling the ribbon a "symbol of terrorism." Some parties made statements intended to discourage the use of the ribbon in Kazakhstan in 2014 for Victory Day celebrations, suggesting that red (of the Red Army) and turquoise (the national color of Kazakhstan) should be used instead. However, no official authority issued any comments. The government of Latvia proposed the ban on the use of any Ribbons of Saint George by law in May 2014; earlier, Latvia imposed a ban on the use of all Soviet symbols at public events. The ban on similar grounds to that in Latvia has been discussed. Soviet Medal "For Victory over Germany in the Great Patriotic War 1941-1945"
Wikimedia Commons has media related to Ribbon of St. George. ^ Kashin, Oleg (1 May 2015). "Hunting swastikas in Russia". OpenDemocracy.net. ^ Karney, Ihar; Sindelar, Daisy (7 May 2015). "For Victory Day, Post-Soviets Show Their Colors – Just Not Orange And Black". Radio Free Europe/Radio Liberty. ^ a b "Георгиевская ленточка стартует в Брянске". 2 April 2019. ^ a b Sindelar, Daisy (April 28, 2014). "What's Orange and Black and Bugging Ukraine?". Radio Free Europe/Radio Liberty. Retrieved 18 May 2014. ^ Активистка Майдана: "Это я сожгла три колорадские ленты" (in Russian). Moskovskij Komsomolets. March 30, 2014. Retrieved 13 April 2014. ^ a b c d e f Anatoly Korolev and Dmitry Kosyrev (11 June 2007). "National symbolism in Russia: the old and the new". RIA Novosti. Retrieved 23 February 2015. ^ "СТАТУТ ВОЕННОГО ОРДЕНА СВЯТОГО ВЕЛИКОМУЧЕНИКА и ПОБЕДОНОСЦА ГЕОРГИЯ". ^ a b Alexei Rudevich (25 April 2014). 5 фактов о георгиевской ленте [5 Facts about the Saint George Ribbon]. Russia7 (in Russian). Retrieved 23 February 2015. ^ Mikhail Medvedev (8 May 2017). Георгиевская ленточка: победа прихоти над культурой [Ribbon of Saint George: fads prevail over culture]. Saint George (in Russian). Retrieved 3 September 2017. ^ a b c d e "Ukraine breaks from Russia in commemorating victory". Kyiv Post. Retrieved 8 May 2015. “In the 1960-70s there were no St. George’s Ribbons seen during the Victory Day parades. If someone showed up with a ribbon, it would be a violation. ^ "Георгиевская ленточка на старых (советских) открытках" [Ribbon of Saint George in old (Soviet) postcards] (in Russian). 21 December 2017. Retrieved 2 April 2019. ^ Malgin, Andrei (April 16, 2014). "The Black and Orange Ribbon of Putin's Army". The Moscow Times. ^ "В Москве облили зеленкой Улицкую" (in Russian). Lenta.ru. 28 April 2016. Retrieved 10 May 2016. ^ "Crowd wearing nationalist symbols attacks children's school competition organized by historical society Memorial — Meduza". Retrieved 12 August 2016. ^ "Meduza correspondent assaulted by member of crowd disrupting Memorial society young scholar awards — Meduza". Retrieved 12 August 2016. ^ "Putin's ultranationalist base takes aim at the West". Retrieved 12 August 2016. ^ Bigg, Claire (May 6, 2014). "Kyiv Ditches Separatist-Linked Ribbon As WWII Symbol". Radio Free Europe/Radio Liberty. Retrieved 2014-05-09. ^ "Кировоградские ветераны отказались от георгиевских лент на 9 мая : Новости УНИАН". Unian.net. 2014-04-23. Retrieved 2014-05-09. ^ "Председатель Черкасской ОГА призвал отказаться на 9 мая от георгиевских лент : Новости УНИАН". Unian.net. 2014-04-26. Retrieved 2014-05-09. ^ Yaffa, Joshua. "Vladimir Putin's Victory Day in Crimea". The New Yorker. Retrieved 2014-05-09. ^ "Ukrainian Lawmakers Back Ban On Ribbon Embraced As Patriotic Symbol In Russia". Radio Free Europe/Radio Liberty. 2017-05-16. Retrieved 2017-05-16. ^ "Георгиевская лента напугала Лукашенко". Retrieved 12 August 2016. ^ "Russians embrace Kremlin-backed WWII ribbon". Retrieved 12 August 2016. ^ "Pro-Russia parade planned for city riles local Ukrainians". WinnipegFreePress. 9 May 2014. Retrieved 9 May 2014. ^ Черно-оранжевые ленты не будут использоваться в ходе празднования Дня Победы в Казахстане. (in Russian). Dialog.kz. Retrieved 16 February 2015. ^ "Latvia proposes ban on Russian St. George's ribbon". Retrieved 10 September 2014. ^ "Lithuanian faction: St. George Ribbon a symbol of 'Russian aggression and imperialist ambitions'". Retrieved 12 August 2016.